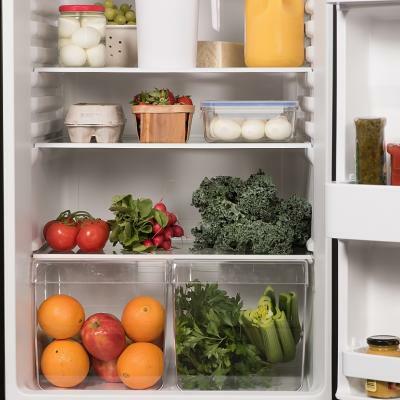 Eggs may be the most important ingredient in your fridge! They’re nutritious, they taste great, and their physical properties and components make them indispensable in the kitchen. Eggs form the foundation on which many cooking techniques and recipes depend. Along with water, protein is a key component of egg yolks and whites. Protein is made of long chains of amino acids tightly coiled by weak bonds. When protein is heated or air is beaten into it, its bonds come apart, and the chain partly unwinds. The protein is now denatured, or changed from its natural state. As the proteins unfold, they expose their hydrophobic (water-hating) and hydrophilic (water-loving) ends. The proteins form new bonds, arranging themselves so their water-hating ends are in the air and the water-loving ends are in the water. This creates a web of protein molecules that hold the air bubbles in place. If the proteins are overheated or overbeaten, the bonds will tighten and squeeze out the moisture, leaving the eggs dry, firm and rubbery. Eggs have a great ability to leaven or puff up foods when air is beaten into them. Egg whites are especially good at this and, when beaten, they create a foam that has more stability and volume than whole eggs or yolks. When air is incorporated into the protein molecules in egg whites, the proteins unwind and stretch to form an elastic web that encases the air bubbles. Egg whites can expand up to eight times their volume. They provide volume and structure to soufflés, angel food cake and meringues. 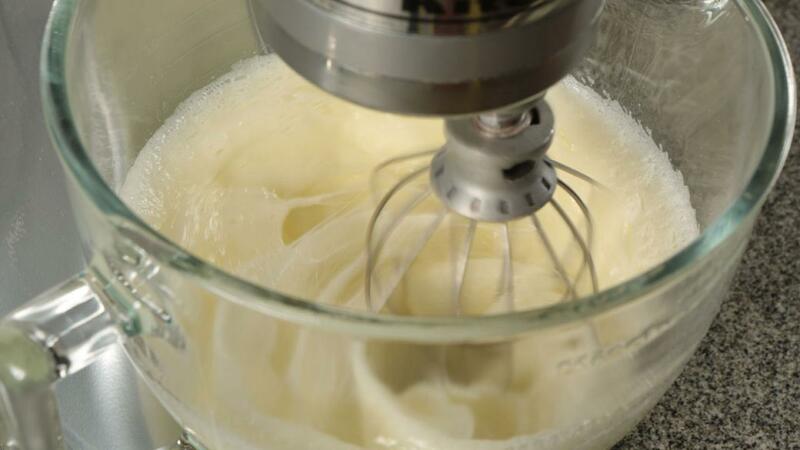 Room temperature egg whites create the best foam volume and stability. Adding an acid (e.g. cream of tartar, vinegar, lemon juice) will help to strengthen and stabilize a foam. Any fat, such as a trace of egg yolk mixed in with the whites, or oil in the bowl, or butter or cream on the mixing utensils will diminish the foaming ability of the whites. Whole eggs and yolks can also trap and hold air that expands during heating, leavening cake batters and sauces such as sabayon. Hollandaise sauce and mayonnaise are good examples of an emulsion, the blending of two incompatible liquids such as oil and water. Since these two liquids don’t mix, an emulsifier is needed to hold the oil molecules in the water without the ingredients separating. The lecithin in egg yolks is an excellent emulsifier. With the water-loving end of the lecithin molecule buried in the water molecules and the water-hating end buried in the oil molecules, lecithin forms a thin film around tiny drops of oil enabling them to remain suspended in a water-based liquid. Creamy desserts such as crème brûlée also benefit from eggs’ ability to emulsify and produce smooth, satiny, homogeneous mixtures. Their ability to hold up to four times their weight in moisture makes eggs a good thickener for sauces, custards and curds. The proteins in eggs coagulate or set at different temperatures. This results in thickening but it means that eggs must be cooked gently and heated carefully or they will scramble rather than thicken a sauce or other mixture. Egg white becomes jelly-like at 140°F (60°C) and firms at about 149°F (65°C). Egg yolk starts to set at 144°F (62°C) and is fully set at 158°F (70°C). A whole egg coagulates at about 156°F (69°C). Eggs can act as binding agents. As their proteins set, eggs bind ingredients together giving strength and stability to meatloaves, casseroles and baked goods. Eggs are used to coat foods with crumbs, flour, etc. as they help these ingredients adhere and also help to create browned appearance when cooked. Eggs have a stickiness that allows them to be used to bond two pieces of dough or pastry together (e.g. a decorative pastry garnish on a pie crust) or to provide a sticky surface on which to sprinkle seeds (e.g. poppy seeds on the top of a bun). Protein browns when exposed to heat. Brushing pies, biscuits, breads and buns with an egg wash (beaten eggs alone or combined with water, milk or cream) before baking gives them a bronzed and glossy sheen.